The morning began with an unexpected surprise from our leaders. The night before we received instruction to be down in the lobby at 6:30am ready to get on the bus. When we all arrived, Caroline told us that we were going on a safari game tour! The safari consisted of seeing animals like water buffalos, giraffes, lions, elephants and so much more. Our trusty tour guide Frances did an amazing job of pointing out animals while getting us where we needed to go in a very timely matter. It was a great way to end the trip. We then departed back to Kampala. When we first arrived, we were treated to some pizza in a modern food court type of area. After eating we hopped in the bus and headed to one of the downtown markets to shop. Prior to getting off the bus Sam let us in on the tricks of the trade in the realm of African bargain shopping. After we felt confident in how to get the best deals, our team headed to the sidewalk shops. In the hour we had to shop our purchases consisted of chess boards, soccer jerseys, many animal figurines, patterned clothing, jewelry and sandals. Some went to a cool coffee shop after the market and bought coffee beans. All of our hearts are very full when reminiscing on memories from our trip over the past week. It was hard to say our final goodbyes to two people who have had a big impact on our trip, Sam, a member of the Sports Outreach team, and Wilfred, our bus driver. As we sit in the airport it is bittersweet to be leaving, but we find comfort knowing that the two of them and all of the other people we have encountered during this trip will remain in our hearts. We ask for your continued prayers as we begin our travels home, may God bless. Posted on August 22, 2018 Author Caroline DykstraCategories Summer 2018, Uganda 2018Leave a comment on Lions to the Left! Posted on August 21, 2018 Author Caroline DykstraCategories Summer 2018, Uganda 2018Leave a comment on Smile, It’s the Nile!! THE SUN WAS SHINING AND WE WERE SO EXCITED TO START OUR DAY!!!! Prior to heading out for the day, we had a delicious breakfast prepared by the gracious hands of Rose. Our first adventure of the day was visiting a village for water filter demonstrations and fellowship with the community members. As we arrived, some women from the village had prepared a welcoming dance routine for our group. We all appreciated this from afar, but were quickly encouraged to join them in dancing and praise. Although all members of our group failed to master the variety of dance steps, it was an amazing experience and brought a smile to our faces. A children’s choir also welcomed us with a song. Following the welcome, we did a series of brief introductions and transitioned into serving the children their breakfast. As we walked to the school house for breakfast, each of us had a swarm of kids clinging to our arms. While the children were eating breakfast, we had the opportunity to sit with them and enjoy their joyful presence. Their smiles are so radiant and contagious. We moved right into the water filter demonstrations after the children had finished their breakfast. Similar to our experiences from the last few days, this was a really humbling experience. The authentic joy that was evident when seeing the pure water drain out of the filter was eye-opening. The next portion of our day included a series of home visits where two women graciously welcomed us into their homes. They were willing to be vulnerable with us, sharing us intimate details regarding their past. We were fortunate to be able to share a number of verses and words of encouragement, followed by prayers of praise and support from members of our group. It was a powerful experience, and we could feel God’s presence in each of the homes that we were welcomed into. We were ecstatic for the final portion of our afternoon that included another visit to a village, where we did another water filter demonstration and led a sports clinic. Following the water filter explanation, we gathered the children in the field and separated them into groups for stations. This was an uplifting experience to share our love for sports with the children. They were all really engaged and couldn’t help but have big smiles on their faces. At the end of the clinic, we gathered as an entire group and played a large game of sharks and minnows. As you may imagine, this could be described as organized chaos. Following lots of heart-felt hugs, we began our journey back to the Sports Outreach compound. At devotions tonight, we took some time to affirm one another and share the love. We have quickly become a tight-knit family. 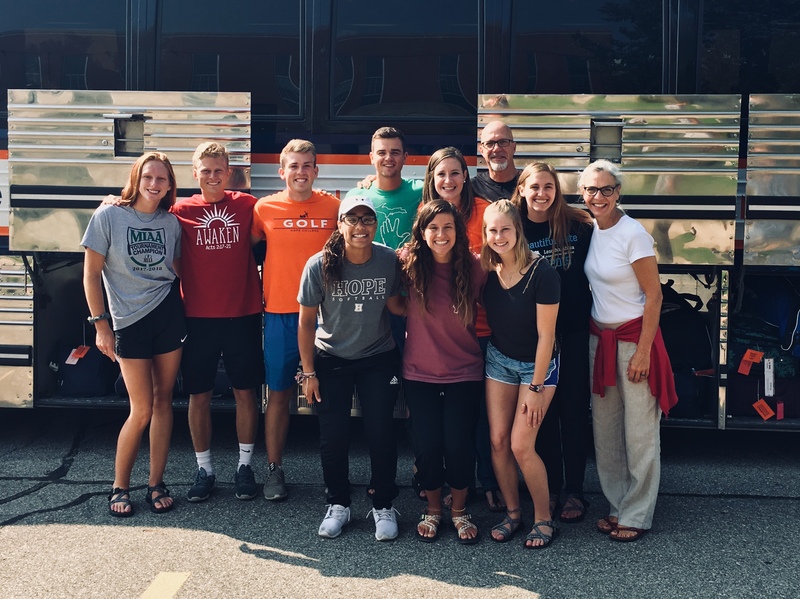 During the remainder of the trip, we look forward to continuing to see how our relationships continue to grow and the ways in which God works. This morning we were blessed with the opportunity to attend New Foundation Church located on the Sports Outreach compound. In this church, we continued to be welcomed wholeheartedly as we have experienced throughout this trip. It is hard to find words to describe how powerful this service was. We were inspired by their passionate worship and love for God. Our feet were moving and our hands were raised in the air, as we praised God alongside our brothers and sisters in Christ. Daniel, Noah, and Erica had the opportunity to speak in church and share about part of their walk with God. We pray that the people in the church were encouraged and blessed by these testimonies. It reminds us that even though we come from different places and backgrounds, we are all God’s children and serve Him. After church, some of the Sports Outreach staff gave us a tour of the Koro Farm. It was amazing to see the work they are doing to grow their ministry. We had the opportunity to visit the vocational school. This school provides the girls from Christine’s House an opportunity to learn skills to help them when they return to their communities. Inside the school, there was jewelry and hand-sewn crafts. We were able to purchase some of these to help support their ministry. On this tour, we also got a glimpse of the future aspirations of Sports Outreach. They are in the process of building two villages to house refugees and girls who are transitioning out of Christine’s House. We will be praying for Sports Outreach, and we’re excited to see how they continue to grow in the coming years. In the afternoon, we dedicated our time to interacting with communities through the distribution of water filters. We also spent this time using sports as an opportunity to share God’s love with others. It was such a joy to see the faces of the people in the villages when they saw pure, clean water coming out of the filter. There was so much beauty in watching lives be changed through these filters. We also shared the message that the dirty water is a representation of our lives without Jesus. When we accept Him into our lives, He acts as the filter, making us clean and pure. In the second village, we ran a sports clinic for the children. Our team was overjoyed with the experience of sharing our love for sports with the youth in this community. Seeing radiant smiles and receiving countless hugs was a humbling experience. Joy truly abounds in all aspects of their lives. We are truly blessed by the opportunity to be here in Uganda. Our team continues to deepen our relationships with one another and lift each other up. God orchestrated this team beautifully. Although our time in Uganda is not as long as we expected, God has remained faithful. We are overwhelmed by how we have seen God working in our lives. By connecting with local communities, He has reminded us of his unending love for His people. Your prayers and support mean the world to us. In the coming days, we will remain open to what God has in store for us. “The end of all things is near. Therefore be alert and of sober mind so that you may pray. Above all, love each other deeply, because love covers over a multitude of sins. Offer hospitality to one another without grumbling. Each of you should use whatever gift you have received to serve others, as faithful stewards of God’s grace in its various forms. If anyone speaks, they should do so as one who speaks the very words of God. If anyone serves, they should do so with the strength God provides, so that in all things God may be praised through Christ Jesus. To him be the glory and the power for ever and ever. Amen. We began our day with a trip to the Sports Outreach Chess Academy. The building was about a 30 minute bus ride through downtown Kampala. This was a unique experience for our team that allowed us to learn and ask questions of the coaches, trainers and chess students. Though the duration of time we stayed was brief, the impact was real, the work God is doing in the lives of the chess students was obvious. After boarding back onto the bus, one of the chess coaches Richard, graciously gave our team a tour around the slum of Katwe and we saw where portions of “The Queen of Katwe” was filmed. We then embarked on our journey to Gulu, a village roughly 7 hours from the city of Kampala. We traveled by bus along paved roads for a majority of the journey and had a lot of time to share stories and grow closer as a team. We got to see the Nile river, some monkeys, and even some ambitious baboons that would jump on moving cars. We arrived at the Sports Outreach Center and were immediately welcomed. We gathered as a group and did brief introductions before breaking off into the guys playing a soccer game and the girls spending time with Christine’s House of Anointing. Christine’s House is a group of women who serve younger girls who are facing difficult situations at home. Here they are fed, given a place to sleep, ministered, counseled, and embraced with a loving and supportive community. The girls in Christine’s House were so joyful and welcoming, even though they have been through so much. There are a couple girls who have recently given birth to precious and healthy babies and a few who are expecting. We got the opportunity to hear a couple of testimonies from the girls and how Christine’s House has helped transform their lives. It was so powerful how open the girls were just right off the bat, sharing their stories to complete strangers. They trusted us and it showed how desperate they are to be loved and to show God’s love. We have been asked to pray for peace, provisions and enlightenment in the girl’s lives. The guys attempted to run some futbol, or soccer passing drills with the kids and struggled through the language barrier and lack of skills. However, the ability to use hand motions, eye contact or facial expressions, and demonstrations allowed us to connect with the kids and have fun running simple practice drills. This transitioned to a full-fledged 10 on 10 soccer match that brought out the fast paced, energetic side of two golfers and a washed-up baseball player. It was such a joy to compete and spend time with the kids that ended up turning into some education on the importance of stretching, and devotions. It was moving when we transitioned from working as a soccer team, to sharing how we can all work together on God’s team, supporting each other and most importantly, loving one another. In the coming days, we will be sharing in church, ministering through water filter distribution, and interacting with younger kids in the community by running sports camps. We are so blessed to be in Gulu and have this opportunity to served alongside the beautiful people of Uganda. Thank you for your continuous thoughts and prayers. We arrived safely last night at 10:00PM in Entebbe and afterwards we took a short bus ride to our hotel in Kampala. This morning we were served breakfast with a few members of the Sports Outreach team. Following this, we headed to their facility just outside of Kampala to continue the rest of our day. Then we travelled as two groups to a number of homes to understand the stories of families in different communities and surround them in prayer. These visits revealed the authenticity and graciousness of Ugandan culture. It also was a clear indication of the strong faith that many individuals had in weak circumstances. The team at Sports Outreach cooked us a delicious lunch and we then went to a community called Kawempe for more home visits and a Sawyer water filter demonstration. In introducing the water filters, we were able to connect the filtration of the dirty water, to the reconciliation of Christ’s death on the cross to make us clean and pure. Upon receiving the water filters, community members were more worried about sharing the precious gift of clean water with their neighbors rather than its use for their own families. A separate group went into the heart of the community during the demonstration to visit a few more homes. During this trip, the bond between families and individuals in the slum were unlike any relationship we had ever seen. The dependence and trust of people made the love of Christ evident and alive in the same way as during the water filter demonstration. We returned to the hotel for a devotion and debrief where we could share how we saw God during our experiences today. The smiles of the Ugandan community touched us along with their authenticity and vulnerability during home visits. The graciousness of the people we came in contact with was telling of Christ’s love as well. Finally, we saw God in the faith-driven consistency of the actions and words of the Sports Outreach workers and people. Tomorrow we embark on a 7-hour bus ride to Gulu for another aspect of Sports Outreach in Uganda. We ask for prayers for the people we will come in contact with, as well as those we shared fellowship with today. We want to continue to learn and understand how we can best teach and be taught in the communities we will serve. Alarms went off and we boarded the Hope bus at 6:20 am for Chicago. We arrived in O’Hare Airport without any complications. Our group was overjoyed to finally start our journey after two days of anticipation. Prior to our departure we spent a majority of our layover collaborating in several games of Euchre. Though everybody claims to be victorious, it has been fun experiencing our teammates completive aspects aside from athletic competition. We are currently in the Detroit Airport awaiting our flight to Amsterdam. Our team is continually uplifted by those we come into contact with. Between conversations in terminals and on the aircraft, the new individuals God placed in our path continue to remind us that everything is perfectly crafted in his plan. In the next 48 hours, we will be traveling to Amsterdam and then on to Uganda. These legs of the journey will be new experiences for many members of the team. As soon as we get to Uganda, we plan to hit the ground running and can’t wait to share our experiences. Thank you so much for your continuous support and prayers through these days of travel. Our trip did not get off to the start we expected. An overheated bus on the way to the airport prompted a change of transportation. Our hope of reaching our plane on time was a man named Tom and his white, unmarked, door slightly ajar van. Nonetheless, it was our last chance. We pulled up to O’Hare praying that the airline would wait for us at the gate, but we missed our window of opportunity by 15 minutes. At this point with not many available options, our leaders exhausted every connection that they had to get us to Uganda. Unfortunately, we were forced to push our flights back to Wednesday. However, this minor hiccup only brought our group closer together. We drove back to Holland Sunday night and began to develop a plan for the borrowed time of the next few days. After meeting at Phelps for lunch on Monday, we were able to study the gospel of John as a team and watch Queen of Katwe, a movie based on the chess ministry of Sports Outreach in the suburbs of Kampala. Finally, we were blessed with the hospitality of the Droppers Family who opened up their house for us to have dinner and spend time on Lake Michigan. Today, we spent more time off campus in the afternoon beginning with some time spent in the Word. The rest of the day we spent on the beach and enjoying time together as a group. We were disappointed that we missed our flight on Sunday, but God had others plans for this team. We were able to take advantage of the extra time we had in Michigan and spent it in meaningful fellowship. This time to bond as a team will serve us well as we make the trip to serve in Kampala and Gulu tomorrow. We appreciate you checking in on our team. 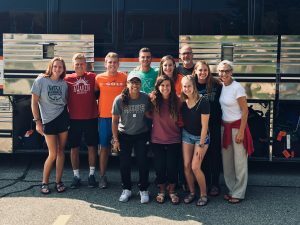 We ask for prayers for traveling mercies and a smooth transition for us into the mission field. Due to a bus complication on the way to the airport on Sunday, our Uganda team was unable to make their flight. We are rescheduled to depart on Wednesday, August 15 to arrive in Uganda on Thursday, August 16. While our travel delay is disappointing, we’re choosing to make lemonade as we continue bonding as a team in Holland and preparing our hearts to serve. We’ve been talking as a team that life as a Christian is a journey, but through all things, we know that God is in control and He is good. Our team remains expectant that God is going to do big and mighty things in and through us, and for that, we are grateful! Posted on August 12, 2018 Author Caroline DykstraCategories Summer 2018, Uganda 2018Leave a comment on Meet the Uganda Team!